Updated February 17, 2019 – Now showing results for 18 different sprays. Why Use a Spray Sealer for Polymer Clay? Why would you want to use a spray varnish or sealer with polymer clay? First, let me address a common myth. You do not need to seal polymer clay to protect it. Once properly cured, polymer clay is a durable vinyl plastic and is, itself, naturally waterproof. No sealer is more durable than polymer clay. There are two reasons you’d want to use a varnish with polymer clay. One is when you need to protect surface treatments that you’ve used on your clay creations, such as mica powders or chalks. The other is if you want to change the gloss level, making your creation glossy or matte. Read my article Do You Need to Seal Polymer Clay for more information and a list of recommended brush-on sealers. But sometimes brushing a sealer onto the surface of the clay can disturb the surface treatments. Or perhaps the surface is so highly textured that brushing on a sealer becomes impractical. If you are troubled by too many brush strokes, it can be a compelling idea to use a spray to give a nice even finish. This article focuses on the basic chemical compatibility of various spray sealers with polymer clay. I picked cans of spray that were readily available in stores near me, plus a few others that I had heard about online. There are hundreds of sprays to choose from and buying them all would have been a cost prohibitive, so I had to trim it down and at least get started testing the most popular ones here in the US. Just because a spray isn’t listed doesn’t mean it doesn’t work. I would love to test even more, but at $8-$25 per can, I’ve already spent a small fortune on cans of spray sealer! PYM II is still the stand-out winner for being compatible with polymer clay, but it is no longer made. Helmar Crystal Kote Matte is excellent if you need an invisible or matte coating. Most spray sealers don’t fully dry on polymer clay and stay sticky. Results vary greatly depending on which polymer clay is used. It’s not the propellants that degrade the clay, rather the sealer itself becomes tacky. Spray Varathane and Minwax Fast-Drying Polyurethane will both dry nicely on polymer clay, but may scratch off some brands of clay. Always test your spray sealer before using it on an important project. You can sometimes remove sticky varnish by using rubbing alcohol. If it’s only a tiny bit sticky, you can overcoat with a clay-safe brush-on varnish. Tiles of polymer clay waiting to be sprayed with sealant to test compatibility. It should be noted that I used black clay merely so that I could more readily see any crazing or cloudiness that might occur. Other polymer clay artists have told me that different colors of clay, even within one brand, have different reactions to sealers, so your results may very easily differ from mine. Also, testing on black didn’t reveal if any of these sealers would turn yellow over time. Many spray sealers don’t dry on polymer clay and stay sticky and gummy. I was very surprised to see that no sealer behaved the same on different brands of clay. In general, spray sealers were the stickiest on Fimo Professional and were less sticky on Sculpey III. And every spray sealer except PYM II could be peeled or scratched off of Kato and Premo with my fingernail, but several of them were more durable on Sculpey III and Fimo Pro. These inconsistencies might explain why people are reporting good results with one spray sealer when others report that it gets tacky over time. Most spray sealers readily scratched off of Kato Polyclay. As the humidity increased in my studio, the tiles became more sticky. If a tile was sticky at any time during the test period (after the initial 24 hours), then I considered that sealer to be a “fail”. Even a tiny amount of stickiness would make a bead stick to the wearer’s hair, or dust and pet fur stick to a figurine. Sticky, gummy sealers collect animal fur and dust from the air. Several of the sealer/clay combinations were nearly perfect except that the sealer could be scratched with a fingernail. Obviously, you wouldn’t want to use these spray sealers for functional objects and jewelry. But for a figurine that will sit on a shelf, they’ll be suitable. I’ll identify those below. It’s common for people to complain that the smell of spray varnishes can be quite strong. And yes, they’re pretty smelly during application. After 1 month, however, I don’t find any of the spray sealer varnishes to have any remaining smell. In fact, I can readily smell the Premo and Kato itself, but not the sealers. Years ago, this brand was recommended as being the only one that was safe for polymer clay. But the formulation has changed over time (as has that of polymer clay) and I wanted to see if it still worked. It doesn’t. This glossy spray remained very sticky and tacky on all clays tested. All four samples readily took fingerprints and the sealer was easily scratched with my fingernail. Not Recommended. Mod Podge is a trusted craft brand name and therefore clayers will reach for this one because it seems like a good idea. It is not. It remained sticky on every brand of clay tested. It was, however, fairly scratch resistant on Fimo Professional, but since it’s so sticky it can’t be practically used. (By the way, I don’t recommend the original Mod Podge brush-on as a sealer for polymer clay, either.) Not Recommended. I was surprised to find that this spray is very similar to the Varathane brush-on that we all know and love. It goes on milky white and even smells the same. It has the same dry, smooth feel that Varathane in the can has. But for some reason, the spray action wasn’t very smooth. The spray was fairly coarse and gave a speckled coating on the clay that didn’t self-level. This gave a sort of orange peel surface texture (see photo below). Even though this was a can of gloss sealer, the effect was only what I’d call a semi-gloss. This spray sealer didn’t have even a hint of stickiness, but it also was readily scratched from Sculpey III, Premo and Kato with my fingernail. (For what it’s worth, brush-on Varathane can often be peeled from clay in the same way. In use on beads it doesn’t seem to matter much.) On black, spray Varathane gave a very slightly cloudy effect that wasn’t quite as clear as the other sealers. But for most things I wouldn’t find this to be a problem. Recommended for some purposes. This is Varathane Spray Gloss on a test tile made from Kato Polyclay. Note the orange-peel texture that the spray left and also note how readily the sealer can be scratched and peeled from the surface of the clay. This spray sealer is very commonly recommended for use with polymer clay and yet others complain bitterly about how it ruined their projects. I really, really wanted this spray to be a winner because it was exceedingly thick and glossy, making the clay look like it was coated in resin. But every one of my clay samples, all four brands, became sticky at some point during the month. At first, I thought it was just slow drying, but no. It wasn’t sticky at one week, but at the one month point the stickiness returned. This sealer was easily scratched with a fingernail from Premo and Kato, but did hold up better with Sculpey III and Fimo. But there was also a fine crazing on Kato and Fimo. It was almost a winner for use with Sculpey III, but there was that annoying tackiness. But if you’re just doing Sculpey III, you might have better results than I did with this one, especially if you live in a dry climate. Not Recommended. This sealer was not as glossy as the Krylon. And it tested to be a perfect sealer on Sculpey III with no stickiness, fingerprints, peeling, or cloudiness. On Kato, it wasn’t sticky, but did peel readily and was just a tiny bit cloudy after a month. However, on both Premo and Fimo, this spray sealer was sticky and therefore unacceptable for use with polymer clay. If you’re just making figurines that will sit on a shelf, this would be a great sealer if you use Kato or Sculpey III. Limited Recommendation. PYM is no longer manufactured. In the US, you can buy here online or in person at Creative Journey in Georgia. The only sources I know outside the US are both in the EU. Happy Things and Hobbyrian both have stock, but they can’t ship out of the EU. This spray sealer is the “gold standard” for using with polymer clay and I’ve sung its praises before in a review that you can read here. It’s a very different kind of spray sealer made by a small company in Georgia in the US. It’s made for sealing paper, originally, but it works well with all brands of polymer clay. It’s not sticky or tacky, you can’t leave fingerprints in it, and it doesn’t scratch off polymer clay. I did see a tiny bit of scratching on Kato, but on the others the sealer was stuck very tight to the clay. I didn’t see any cloudiness with PYM II, but through conversation with Doug (the owner), I understand this can be a problem if it’s very humid during application. Doug says you can fix it, though, by simply heating your clay until it’s clear once again. Some people complain about the odor of PYM II, but compared to all the other sprays I used in this test, PYM was almost pleasant. Think of it as being like hair spray rather than spray paint. A lot of people use PYM as a first-coat fixative and then use brush-on sealers over the top for durability. Highly Recommended. I really had to laugh at the name of this one. It was the slowest drying of all the sealers that I tested. In fact, it took so long to dry that I only put two coats on the test tiles. But even with two coats, this sealer had a nice glossy appearance. It took several days to fully dry and stop being tacky to the touch. But once fully dried, this sealer was not tacky or sticky on any of the clays that I tested and didn’t take fingerprints. It also didn’t have problems with crazing or getting cloudy. The only drawback of this sealer was that you could scratch it off Kato and Premo with a fingernail. On Sculpey III and Fimo Professional, Minwax Polyurethane was an excellent high gloss spray sealer. Limited Recommendation. I only chose this because I was ordering the one below and just included it in the order. Duncan is a brand of supplies for ceramic artists. This high gloss might work well on ceramic, but it was an epic fail on polymer clay. It was so gummy that it attracted cat hair and dust while just sitting on a shelf in my studio. The surface never really dried, so scratches I made with my fingernail on week one had self-leveled and “healed” by one month. This one has no place in polymer clay. Not Recommended. Recommended for polymer clay in a post by Karen Schofield, this is the only matte spray that I tested. Interestingly, it was a nice matte spray and gave a smooth, even surface. It was very matte, but not “dead matte”. In other words, the light did reflect, but not a lot. At first, I had great hopes for this sealer because it was not sticky or tacky at any point. But it very readily scratched off every brand of polymer clay that I tested. And after a month, the surface changed slightly. While not tacky, the surface feels sort of waxy. Like feeling waxed paper. It was not cloudy, but do keep in mind that all matte surface treatments will make your polymer clay appear slightly cloudy and will dull the colors a bit. I used some spare cardboard to hold the tiles when I sprayed them, and I kept the cardboard with the tiles. I can now see that the spray on the cardboard has begun to turn white and chalky. So I’m not so sure this spray will be suitable for the long-term. Edit: over time this turned more and more waxy. It is chalky and unpleasant. Not recommended. This archival spray varnish comes in both matte and gloss versions. The gloss is not super glossy, but does give a nice finish. It works well on all brands of clay tested with the exception of Fimo Professional, which remained a tiny bit sticky. The matte spray, however, was really outstanding. It is truly matte and was completely invisible once sprayed onto the polymer clay. There was no stickiness. 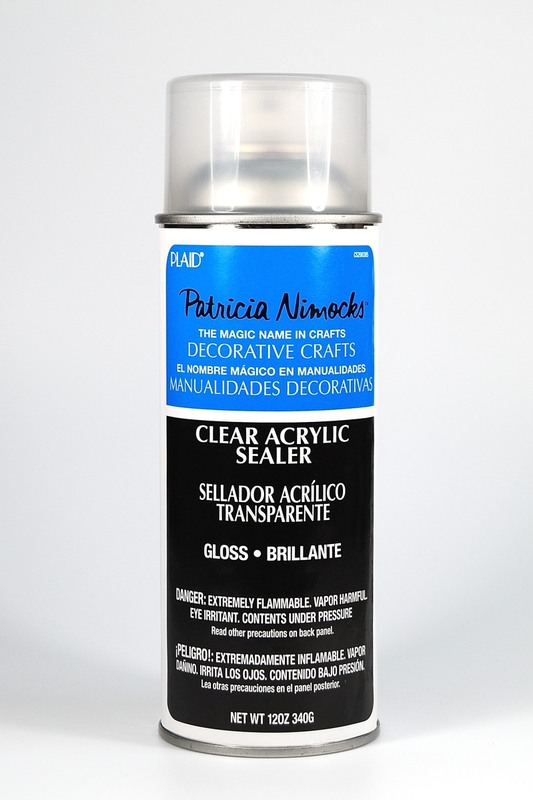 This is my top pick if you need a polymer clay safe spray sealer that is invisible or creates a matte finish. But please be clear, contrary to what the label says, this is not a varnish. This spray will fix your powders, but it won’t give much of a physical barrier to protect your work. You can read more about Helmar here. Highly recommended. This spray was extremely sticky and goopy and never dried on any of the brands of polymer clay that I tested. Awful. Just awful. And interestingly, many people have written to suggest that I test this one. Not recommended. For some reason, this spray was uneven and pebbly. It did not make an even surface and therefore would not make a good varnish. It was also sticky on Premo, Fimo Professional, and Souffle polymer clay brands. Not recommended. This spray was sticky on Fimo Professional. The other brands of clay were not sticky. But this spray left a pebbly, grainy finish that scraped easily with a fingernail. I can’t recommend this with flying colors, but it might have some uses for polymer clay. If you absolutely need a spray, this one might work in a pinch. Limited recommendation. Once again, this often-recommended spray varnish was sticky on all five brands of clay. It is unsuitable for use on polymer clay. Not to mention, it smells terrible! Not recommended. I read about this one on vinyl doll forums and it was recommended by the folks at Rustoleum as being good on polymer clay. Nope. It’s not. It has a fairly glossy finish but beaded up pretty badly on both Kato and Fimo. It was sticky on Premo, Souffle, and Fimo Professional. The finish is pretty good on Sculpey III with no trace of stickiness, but it scratched off easily. Not recommended. It’s easy to assume this spray is supposed to be thick, glossy, and resin-like. It’s not. Instead, it’s a gloss that’s intended to be used over resin to give a glossy finish. In short, it’s just a glossy spray and not a very glossy one at that. It’s sticky on Premo, Fimo Professional, and Souffle. It gives a nice finish on Kato, but scrapes off with incredible ease. The finish on Sculpey III isn’t so bad and is not sticky, but is easily scratched off. The spray also seems to contract and on Premo caused my test tile to curl upward. Not recommended. Often recommended on doll and miniatures forums, this Japanese spray varnish comes in matte and gloss. I tested the gloss version. (I got mine on Amazon here.) It’s SO close to being one that I can recommend. It’s not glossy. It’s really pretty light-bodied and doesn’t give much sheen. It is durable and almost invisible on Premo and Sculpey III. It’s slightly shiny on Souffle and not sticky. It beads up on Kato and is easily scratched off. On Fimo Profesional, it is far more glossy, but it’s ever so slightly sticky. I think you could use this on any brand aside from Fimo Professional, but beware that it’s not a high-gloss varnish. It’s more like a fixative and in that respect is more similar to Helmar Crystal Kote Gloss. In fact, I’d say they’re very similar products. Limited recommendation. I’m not a fan of Sculpey III due to its brittle nature, but people do use it, so what’s the best spray sealer? There are more options with Sculpey III than the other clays. It seems to not have as much incompatibility as the other brands. If you need durability in a spray sealer, choose Rustoleum American Accents Gloss Clear, PYM II, Helmar Crystal Kote, or Minwax Fast-Drying Polyurethane Clear Gloss. If the item will sit on a shelf, add Varathane Spray and Rustoleum Universal to the list. Note: Adding a spray sealer will not make your piece more durable. If you’re getting breakage with Sculpey III, you’re expecting too much from it and you should try another brand of clay. Kato is a very durable and strong clay that is a favorite of caners and anyone who needs a strong result. But it’s also a difficult clay to make any sealer, varnish, or paint stick to. Of all the brands tested for this article, only PYM II was fairly durable on Kato. If the item will sit on a shelf and not be subject to wear, you could also use Helmar Crystal Kote, Varathane, Rustoleum American Accents Gloss Clear, PYM II, and Minwax Fast-Drying Polyurethane Clear Gloss. I’m a fan of Premo, generally, as it’s a good all-purpose polymer clay that’s suitable for most anything you’d like to make. It does, however, have trouble staying hold of sealers and with the exception of PYM II, all spray sealers that I tested could be scraped off of Premo. If you need a durable spray sealer for Premo, PYM II is your answer. If you don’t need durability, however, you could also get by with using Helmar Crystal Kote, Varathane, and Minwax Fast-Drying Polyurethane Clear Gloss. Helmar and Mr. Super Clear also worked nicely on Premo, but they’re not terribly protective. Formerly called Fimo Classic, this clay is very strong and perhaps more commonly available in Europe than in the US. Note that Fimo Soft and Fimo Effect may not give the same results that I found with Fimo Pro. In general, I noticed that if a sealer was going to be sticky with any clay, it was going to be sticky with Fimo Pro. There’s something in the clay that prevents many sealers from properly drying. However, sealers that peeled off the other clays readily stuck tight to this one. I found that Helmar Crystal Kote Matte, Varathane, PYM II, and Minwax Fast-Drying Polyurethane Clear Gloss were all perfectly durable and compatible with Fimo Professional. Fingerprints, animal fur, and dust mar the surface of a sticky spray sealer on a polymer clay tile. So all of that was a clear as mud, right? Well, as they say, nothing is ever simple. PYM II is still my pick for being the best spray sealer for polymer clay, if you can get it. (Now available only in the EU.) But I can also say that Spray Varathane is a good alternative. As is Minwax Fast-Drying Polyurethane. I have also heard from others that Minwax Polycrylic Spray is good as well. Unfortunately, I can’t tell you if there’s a magic ingredient that’s causing some spray sealers to be sticky on polymer clay. The manufacturers of these materials don’t reveal their formulas. Also, what a specific brand has in its ingredient list may very readily change over time. So what works now may not work with the product being sold a year or two from now. Because of the variability of polymer clay and craft product formulations, it’s always best to test any new material to see if it works for your purposes. Don’t take my word for it. If you’ve spent time creating something special, don’t spray it with a sealer without first doing some tests of your own. I’d hate to see your work ruined because a manufacturer changed its formula without changing the label. I’ve read on the internet (and may have even stated myself more than once) that the propellants in spray sealers “eat” or soften the clay over time. I don’t see any evidence of this being the case. In all of the tiles I tested, when I scratch the sticky sealer from the surface of the clay, the clay itself is undamaged. It’s the sealer itself that’s sticky, not the clay. This is good news because it means that it might be possible to remove the sticky sealer from a sticky project. I was able to remove every brand of spray sealer from their test tiles, except Mod Podge Clear Acrylic Sealer, by using straight 91% isopropyl alcohol. I’m not an organic chemist, so I don’t know the chemistry, but I have been privy to some conversations that suggest that plasticizer migration from the polymer clay might be causing the spray sealers to soften and become gummy. This does make sense to me as the problem also occurs with some brush-on acrylic paints and sealers. The purpose of these tests was merely to do quick elimination of brands of spray sealer for polymer clay. I was hoping to find a couple of sealers that worked well across the board, but there really wasn’t one except for PYM II. But depending on the clay you use, there are still some new options to try. Feel free to experiment. Remember, there is no one right way to use polymer clay and the possibilities are as endless as your imagination. Try things, experiment. You just never know what you’ll come up with. I’d only heard of the Duncan spray being used on light colored art dolls and it’s properties may not be unwelcome or problematic for that specific purpose. As fine works of art, they don’t see much handling. I’m not sure the clays you tested were the ones used for sculpting. Mr. Super Clear Spray UV Cut Flat is reportedly preferred by art doll artists, notably the BJD crowd, from what I can tell. Yes, I’d always test, test, test according to one’s specific combinations of materials, down the the specific block of clay in some cases. With doll clays, some brands like Cernit reportedly went through unknown numbers of reformulations, it’s suspected. I say this because I bought doll clays, including Cernit, from the period of time that regormulations were common and more industry wide due to the move away from certain chemicals. Because I write for all types of polymer clay users, I have to report what I see in a variety of ways. You are correct that I didn’t use doll clays. But I did pick four different types that are likely to be used by clayers around the world. I would love to try the Mr. Super Clear spray, but I had to draw the line somewhere. These cans are expensive. All brands of clay went through reformulations in recent years and I’m sure they’ll do it again. The purpose of my article was to rule out the most common brands that are causing failures for so many new clayers and alert them to the issues with finding a suitable spray sealer. If I found a “good” spray in the process, then great. Once the bad ones are ruled out, perhaps I can focus a bit more on using the good ones. Which is why I said the Duncan Super Matte needs a bit more research. Have you done more research on Duncan Super Matte? I have used it for about 6 years without issue on 4 inch 3D figures but also have not compared to other sprays. The clay brands I use are Premo and Fimo Soft. I stopped monitoring the Duncan Super Matte when it began to turn glossy about six months later. It doesn’t get sticky, it just gradually loses its matte finish. I always had good results with Motip Clear Varnish. Motip is available in Europe and you save money, compared to other sealers. it’s around 5 Euros for 500 ml. It’s for cars and basically an acrylic resin. It doesn’t scratch off and even after months and years it’s not tacky at all. Yes, there are brands in other countries that I can’t access. I have heard good things about Motip as well…perhaps it was you who told me about it? I don’t like to recommend products that I’ve not tested personally, but the information is still valid and maybe I can plan ahead and do some testing the next time I’m in Europe. Or at least get some tiles sprayed. 🙂 Thanks for sharing the info. European clayers will be happy to know this info! Yes indeed. Me for one. Any spray that might work is better than it was for us in Europe. But at least we can at long long last get PYM II now. However I was disappointed not to see Pardo clay included in this test. I love Pardo – it’s brilliant for delicate jewellery. So much hardier than Sculpey (super OR III). Pardo is a brilliant clay. In a perfect world, I’d have the time and resources to test everything. But this time Pardo didn’t make it. Thank you for doing this, the information is great. It’s going to save a lot of testing and problems for new clayers. I usually spray my pieces with PYMII two or three times and then rebake them at 200 degrees for 30 minutes and that takes the cloudiness away and strengthens the PYMII, I just wish it didn’t smell so strong. If I’m doing a pendant, I don’t spray on the back, I usually sand and buff a little so the chemicals of the spray aren’t touching the skin. Thank you for doing these wonderful articles and sharing all the information. Of all the sprays I tested, PYM was the most pleasant in smell and lost its “chemical” smell faster than the others. I stinks, sure, but not a lot worse than hair spray. PYM sure is a good product, though. And yes, you can bake it at normal clay temperatures (but not much higher). Hi Ginger, thanks for a great post. I can add that I found that the new Fimo Pro actually gets sticky with water in its raw form (try laying a sheet or ball of clay in water for a few minutes) whereas the old Fimo Classic doesn’t react, so this formula might react with some of these sprays on that basis alone. It’s frustrating for sure to use one or two sealers for years to suddenly discover they don’t work anymore. As a go-to I use PYMII and Fimo brush on Sealer for the new Fimo Pro and still use varathane, depending on project and type of gloss wanted. Thanks again for this review. Just awesome info. You are the best! You save us so much time and money with your wonderful testing. Thanks, Ginger! Thank you Carla. I’m glad it was helpful. LOL, considering we’ve had roofer guys here all day getting estimates, that sounds like a very good idea. It just seems like of…well…you know. I keep trying to write more tutorials but life gets in the way. Your class sounds intriguing. Good luck with it! There’s always the DYI option I suppose! Pour some varathane from the can into a little spritz bottle, add some water, shake. Ta da! Yes, there can be clogging, so it’s not perfect, but if you think of this as a delivery system when you cannot dare to brush a surface for fear of moving or diluting or blending applied surface additives such as pastel, pencil or powder, it has some merit. You are a treasure! Thanks for sharing your research. Great information as always, Ginger. Well written and thought out. Thank you! FIrstly thank you for all your experimentations! You are amazing!! The need for a spray sealer/ varnish is very understandable, and searching the market for the most suitable is as you have noticed expensive and time consuming… And also all this effort and money on your behalf even if it is very informative for me are useless because I live in Cyprus and all these brands of spray varnish don’t exist in our market!! SO the need is there and it’s global and my call goes out to the manufacturers: Please change your existing sealer/varnish formulas into spray ones and we will buy them! It’s not useless information. The products are, sure, but knowing that it’s not the propellants, knowing that it’s the plasticizers that causes problems…that’s helpful. Also, notice that the polyurethane sprays are good, in general. So this gives you some advantage in looking for products that are available in your own country. By the way, you can order PYM II from Marja at Happythings.eu in the Netherlands. So yes, you DO have options. Also, read the tip from Angela in her comment about using Motip automotive varnish. Perhaps you can get that. Also, there is a product in Germany called Schutzlack-Spray fuer Tintenstrahldrucker by company called MP-Multimedia that Bettina Welker says works just like PYM II. Thanks Ginger for this great test. I didn’t have time before, but now I have. Amazing the tests you did. And Maria yes I can ship the PYM II to Cyprus…. without any problems. And like Ginger told you, you have some other options. Thank you for the info!! Great help. wheredo u buy Pym II. couldn’t find it on Amazon ..
It’s only available in a few stores and online from a few places. You can learn more at http://www.pymii.com. Thank you Ginger for another well researched article. I always look forward to reading your emails & they are all filed away for future reference. I am brand new to Polymer Clay and I am so thankful I found you! Thanks for all you do. Welcome to the wonderful world of polymer clay. It’s a fascinating medium, and very versatile. Enjoy! I live in Calgary, Alberta, Canada. I used the Krylon Brand glaze that was an all-purpose spray on two of my polymer clay projects and, unfortunately, are tacky. I thought it was a result of the climate (we have a low humidity up here), but after reading your article, I am not so sure. Is there a safe way to remove the glaze or re-glaze those pieces with a polymer clay safe glaze? I have found that most sealers can be removed with isopropyl alcohol. I use 91%, because I can get it cheaply at WalMart. Just soak a bit of it on, and start wiping the sealer off. This sometimes causes the underlying clay to get white spots, but it usually does completely remove the sealer and then you can paint and reglaze if necessary. Keep in mind, though, that a sealer of any sort is NOT necessary on polymer clay and should only be used if you need to seal in a surface treatment (like mica powders) or if you need to change the gloss level of a piece (to make it shiny or more matte). In general, most sealers will add an element of uncertainty to a piece….they peel, they aren’t as durable, and they can yellow. Varathane is a good sealer, I do recommend it if you are going to use one. But you don’t have to use one. I made some clay covered pens, baked them and then sprayed them…they are sticky and not drying… I know you said sometimes the formulas change and are no longer compatible … But, do you know of any way to save my pens? I really hate to toss them…anything ideas at all that I can try would be greatly appreciated. Did you use one of the sealers that I tested in the article? For most of them, I could easily remove the sticky sealer by using 91% isopropyl alcohol. It’s rubbing alcohol, but just a tad stronger. You can buy it at any pharmacy. I wish I could print this full article out. Hi Patty, to print an article from a website, the simplest way is to highlight the parts you want to print, then in your print dialogue look for a tick-box that says something about “print selection”. That way it will print just the areas you have highlighted. It’s not a perfect solution, but it’ll eliminate sidebars, my picture, and all that other “stuff”. Hello Ginger..quiet an elaborate article thanks! i wanted to ask if varathane spray would prove good enough for polymer figurines which are shaded with pastel powder and if so the whole piece would be in its original state, more importantly water resistant if being used in a snowglobe. Do you think the sealant might dissolve with time because of it being water based? I am using Fimo effect for my project. Hi Nini, Varathane will protect the powders, but it will have an uneven, pebbly surface. It is absolutely not suitable for immersion in a snow globe, however. While Varathane can withstand an occasional dunking, it will separate from the polymer with long-term water contact. Hi Ginger – thanks for this post! I only wish I’d read it days ago, before I sprayed my projects with Krylon. They are indeed sticky – is there anything we can do to save these? A coat of something else? Light sanding? For the future, are there non-spray gloss sealers you recommend? Varathane is always good. But I’m right in the middle of evaluating about 45 various varnishes and sealers…they’re about 4 months in now, soon I’ll give a preliminary report about what how they’re doing. Thank you for the amazing article and taking the time to test all of these things. I’ve just started sculpting and painting, using Sculpy III, which I guess in is my benefit here. I’ve used the Patricia Nimrock’s Clear Acrylic Sealer and the Krylon Clear (although I don’t remember if it’s the triple coat or not). I paint EVerything with acrylic paint after it’s baked, then seal it and noticed that with the Nimrock’s, things took a very long time to not be tacky. Then they went out as gifts, so I don’t know if they turned tacky again after a while or not. The Krylon was much more recent and didn’t take as long to dry but now I fear it will revert to tackiness again, too. If the clay is covered with the acrylic paint, would there still be a reaction between the plasticizers in the clay and the sprays or does the paint work as a barrier? I’m afraid to use a brush on sealer because I don’t want to ruin the paint on the sculptures. Any advice would be helpful, thank you. Paints will not usually act as a barrier as they are often susceptible to the plasticizer as well. Use a brush-on varnish. It will not cause your paint to run. Acrylic paint, once dried, is no longer water soluble. I read in one of the other comments about removing the old spray sealer with 91% isopropyl alcohol. Has anyone tried this with a painted piece? Will it remove the paint too? I have a friend with one of my pieces who just informed me that it is indeed, starting to go tacky again (piece was created/sealed in the end of March). I was hoping to be able to save it for him without having to repaint it, as it was his wedding cake topper. I can bite the bullet and repaint it, that’s fine; but would obviously like to save the original paint job if possible. I REALLY wish I had found this site years ago when I started making these things for friends but am glad that I’ve found it now before I actually start making a business out of it. Thank you for all of your help. Yes, the alcohol will remove the paint, too. If it’s only just a tiny bit tacky, you can often remedy it by giving it a coat of Varathane. And I do mean specifically this Varathane. Thank you. I have purchased Varathane and use it now but was unsure if I needed to remove the old sealer off of this piece before I could reseal it with the proper sealant. Thank you again. My brother was talking about getting a spray seal for a project that he is working on. This is something that I had not heard before so I wanted to learn more about the subject. I will let him know to always test the seal like suggested in this post. i wonder if you could take one of the thin ones – like varathane – and put it in a spray bottle or mister? Can you use varnish that is used on wood? If you can your piece can be dipped in the varnish if you are making a pendant that you have drilled a hole for the chain use string dip in can of varnish and hang to dry. Also if you add gems to your creations when should they be added? Before baking? After baking? Yes, varnishes are actually the most common finish used on polymer clay. You can learn more about that in this article. And gems can be added before or after baking. Have a look at this article here. 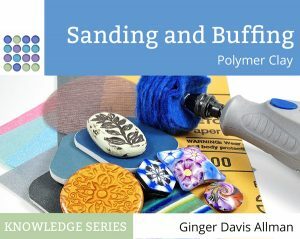 Ginger, you are simply amazing to share all of this valueable information with us, the Polymer Clay Community. You should get a medal! Thank you so very much! I generally use PYM spray and still sometimes the old Pledge now Future product. No problems with either. However I have been looking for a matte Spray, with PYM you do get a bit of a shine, and thanks to you, I found it. Again, you are the best, you are our Polymer Clay Queen or Angel, they both fit!